The Aquarium offers a wide variety of programs scheduled throughout the year for you and your family. Kayak through the splendor of tidal creeks. Find out how to catch the big ones from the surf, the pier or even your kayak. Choose from the list of activities below. Learn the art of harvesting crabs and clams and discover the importance of conserving coastal habitats. Explore Bogue Sound on a stand up paddle board with an instructor to guide you. During this adventure you will learn about all plants and animals that call the Roosevelt Natural area their home. Ages 12 and up with participating adult. Clothing: Clothes and shoes that can get wet and dirty. Shoes must be closed-toe, lace-up shoes (No flip flops) You must also bring an extra pair of clean, dry shoes to wear back into the aquarium. Designed especially for youth, they explore Bogue Sound on a stand up paddle board with an instructor to guide. During this adventure you will learn about the plants and animals that call the Roosevelt Natural Area their home. You must provide your own transportation to the beach. Children 5-17 must be accompanied by a paying adult. Learn to catch the big ones from the surf with hands-on instruction. 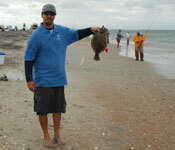 Equipment, bait and licensing requirements are covered. Program is rain or shine, with extra activities added in event of bad weather. Ages 10 and up. Children 10-17 must be accompanied by a paying adult. This program requires you to provide your own transportation to fishing location. Explore tidal flats and quiet backwaters as you become aware of the intricate web of life thriving in this pristine natural environment. The Aquarium provides the canoe or kayak.